Copyright © 2013 Zilong Kong. This is an open access article distributed under the Creative Commons Attribution License, which permits unrestricted use, distribution, and reproduction in any medium, provided the original work is properly cited. The periodic table of elements is arranged based on a series of regular polyhedron. The stability of inert gas atoms can be explained by the distribution of electrons, as well as their motion and magnetic force structure. A magnetic force regular octahedron is proposed. It is a unique configuration that best satisfies the convergence of electrons moving in the same direction within regular polyhedra. In the case of an electrostatic force crust, the formal electron spin accounts for the crusts intrinsic magnetic moment exceeding the speed of light. If one is to consider that the electron has a magnetic outer layer and an electrostatic inner layer, then the question can be solved and abovementioned inference can provide the basis for magnetic force and momentum for the regular octahedron model. The electron periphery has twenty-petal adsorptive substances; the existence of adsorptive substance causes the magnetic force greater than the electrostatic force. Each electronic shell in the regular polyhedron is in accordance with the electron configuration of periodic table of elements; the kinetic track of each electron is a surface of regular polyhedron. The magnetic properties of iron, cobalt, and nickel can be explained by the regular dodecahedron electronic shell of an atom. The electron orbit converged from reverse direction can explain diamond. The adsorptive substances found in atomic nuclei and electrons are defined as magnetic particles called magnetons. The thermodynamic magneton theory can be better explained when it is analyzed using principles of thermodynamics, superconductivity, viscosity, and even in the creation of glass. The structure of the light is a helical line. The study of quantum mechanics entails quantifying atom from energy and momentum, wave properties of particle and other aspects, and various electron configurations. Based on the structure of hydrogen atom, a single electron system is initially developed. The present method is still confined to the energy level, as in a unitary approach. Solid and liquid do not have characteristic spectrum, and they lacked an item of information in energy difference. This article regards the inert gases atom as the initiation point for multiple electron system. The magnetic force structure, in which the electrons interact, is analyzed for the formation of electron configuration, using the simple geometric model, which provides the obvious details. 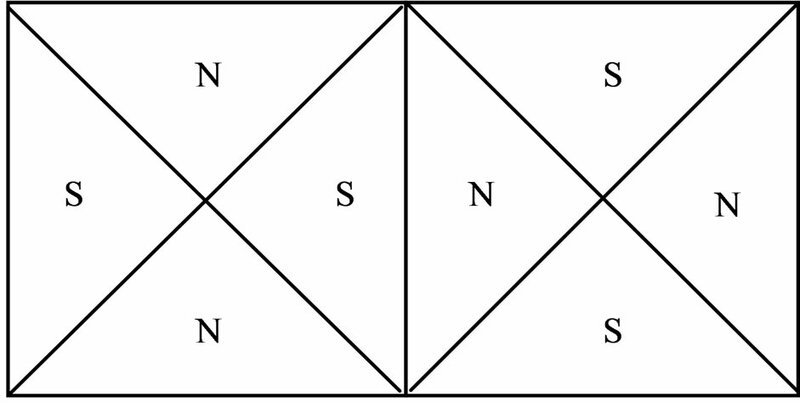 The octet rule  describes the most appearance probability of electrons of stable inert gases atoms configuration situated at the corners of the cube, and this may regard as which indicates that the electrons are close to resting. Now this article discusses the state at which electrons are moving: if one is to disregard that each electron motion must be around the atomic nucleus, changing its motion to a circle around the line that connects the nucleus with eight vertices of cube, then a configuration of eight electrons with stable motion is gained. Its symmetry is unique in the magnetic force structure. If the electron has an electrostatic force crust, the formal electron spin accounts for the crusts intrinsic magnetic moment exceeding the speed of light, which was found by Wolfgang Pauli. Compton wavelength of electron should be explained by a substance. When two moving electrons converge, their electrostatic and magnetic forces interact. The electrostatic force produced between the electrons is repulsion; when the direction of motion of two electrons is the same, it brings about an attractive magnetic force. Thus if the direction of motion is the same when two electrons converge, this becomes a special condition, since the stability of the system must be maintained. When the motion track of electrons is projected around the eight vertices on the six surfaces of cube (regular hexahedron), and the direction of motion of electron is drawn (Figure 1), the condition wherein electrons with the same direction of motion converge is satisfied. 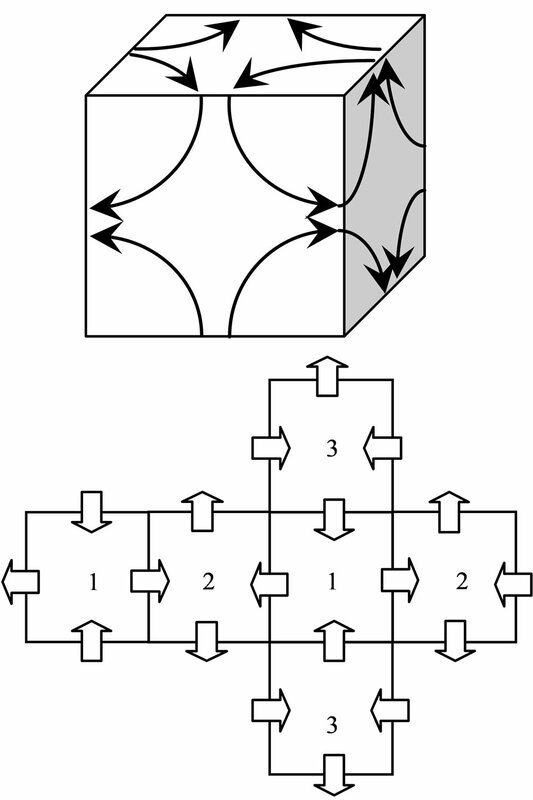 In the unfurled map, the same number of cube faces denotes synchronization of the track of motion of the electrons projected on these two faces. Because the electron track from an edge comes into a face and comes out from the other edge, the number of entry edges is equal to that of the exit edges, thus the total number of edges of the face must be an even number. All regular polyhedra have only five kinds, with the number of the faces taken separately as 4, 6, 8, 12, 20. This is a mathematical theorem (platonic solids, see Appendix 1). The number of edges of each face in a regular hexahedron is an even number, and other polyhedron is an odd number, thus such structure is unique. Figure 1. The projection and the unfurled map on the regular hexahedron. from the nucleus to each of the faces are equal. Eight electrons can form a regular octahedron (Figure 2), which only reflects the track of motion of electrons. Electrons converge at the edges of the regular octahedron, satisfying the condition at which electrons converge with the same direction of motion. 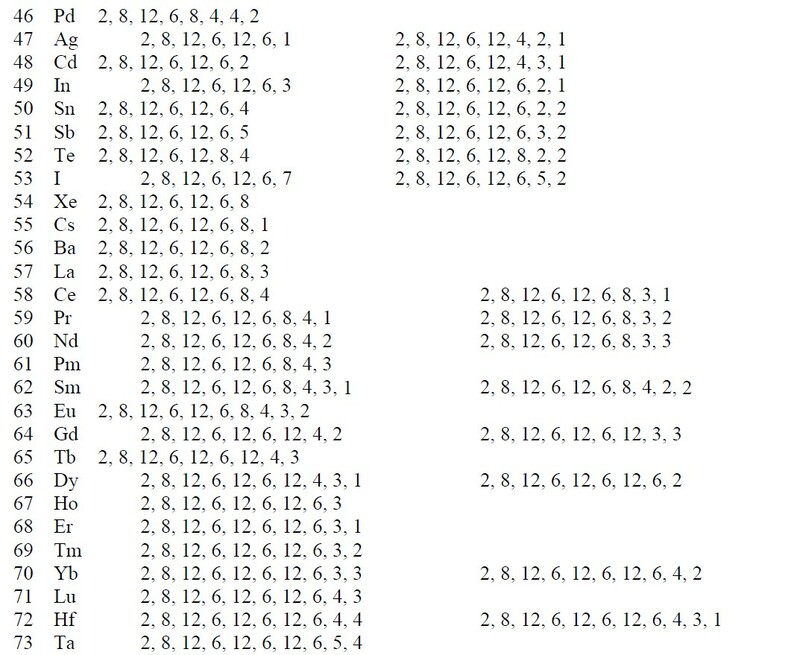 In the unfurled map, the edges of the same number denote synchronization of the track of motion of electrons at the four edges. Because the electron track from an edge comes into a vertex and comes out from the outer edge, the number of entry edges is equal to that of the exit edges, such that the number of edges of vertex in the regular octahedron must be an even number (see Appendix 1), and other polyhedron is an odd number. This again explains the unique property of the structure. The dual polyhedron of the regular octahedron is a regular hexahedron, which is why this result is obtained. Figure 2. The track on regular octahedron and unfurled map. sphere and the spinning produces magnetic moment; then the radius of this electrical property sphere is too small, and the intrinsic magnetic moment is too large: if the value of the intrinsic magnetic moment has to be approximated, the surface speed of sphere will have to greatly exceed the speed of light, many literature referred to this problem. Thus, in terms of distance, the magnetic force and the electrostatic force between two electrons can be compared. Otherwise, if some theory treated the electron as a point particle, this issue may be disregarded, or slide over this question. Now and here assume that the electron has a magnetic outer layer and an electrostatic force inner layer. The electron exterior is surrounded with a layer of magnetic substance that brings about magnetic force; this layer substance is attracted by the electron that joins and rotates about the electron, producing magnetic force and moment. This is the adsorptive substance of electron: its scope radius is a lot greater than the inner layer radius of the electron. When an electron interacts with another particle outside the scope of the adsorptive substance, it produces electrostatic force, magnetic force, and magnetic moment; if another particle enters into the scope of the adsorptive substance, the adsorptive substance is destroyed or changed, the magnetic force and magnetic moment of the adsorptive substance are eliminated or weakened, and the electrostatic force of electron takes over. This assumption is in contrast with that of exceeding the speed of light with a great magnetic radius of the outer layer of the electron, the magnetic radius of electron being the scope radius of the electron adsorptive substance (Figure 3). Figure 3. 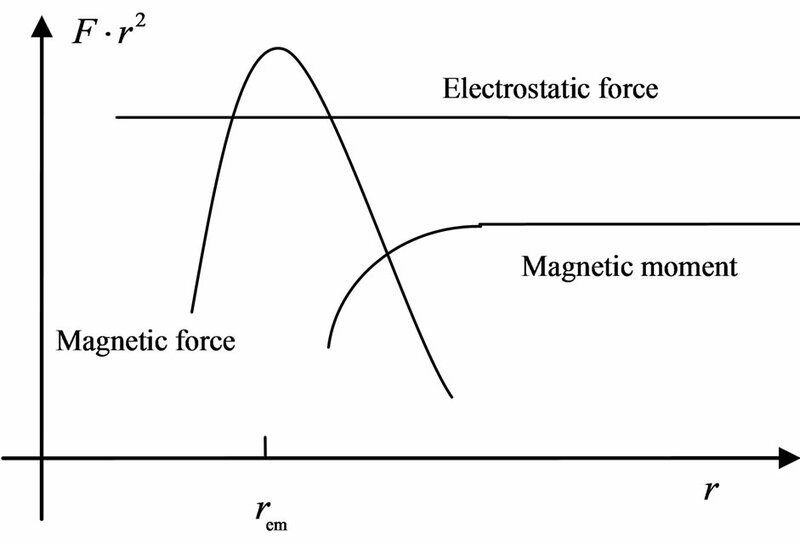 Comparison of electrostatic force, magnetic force and magnetic moment. Figure 4. The motion of the electron adsorptive substance. where is on the same order of magnitude as ; from here one can also see that is Compton wavelength . Along the circle of the electron spin direction, the ring of the electron adsorptive substance is discontinuous. Suppose is a positive integer, the adsorptive substance is composed of circle and the number of petals of electron is . The electron magnetic moment reveals the quantity of electron adsorptive substance. The atomic nucleus also has an adsorptive substance that can be released, and the electron outside the nucleus absorbs the adsorptive substance that the nucleus released, eventually gaining an angular momentum. The adsorptive substance that is dispersed as a result of collision is converted into radiated heat. If is Bohr magneton , then is finestructure constant , the number of petals of electron is 20, that is, the electron has twenty petals. The adsorptive substance release and absorption brings about the transfer of the atomic nucleus spin angle momentum to the electron, becoming the electron angle momentum. The electron and atomic nucleus may keep a determinate distance, thus maintaining the stability of the atom. If all frequencies and phases are the same, the coefficient will be equal to 2. When two electrons with the same velocity and direction converge, their adsorptive substances will also have the same rotational frequencies and phases: the magnetic force of motion of electron will correspond to the charge as that of the electrostatic force. Thus, at the magnetic radius of electron, the total magnetic force corresponding to the electron intrinsic magnetic moment is two times the electrostatic force of the electron. At an appropriate direction, the maximum vector sum of the magnetic force is approximately times the electrostatic force. This illustrates the case wherein two magnetic moments or magnetic dipole adjoin. When distance increases, the magnetic force according to likewise decreases. On a regular octahedron, with the edge serving as a boundary that divides the north and south poles, this on a regular octahedron, with the edge serving as a boundary that divides the north and south poles, this arrangement satisfies the two adjoining poles (Figure 5), this requires that the number of edges of each vertical be an even number. Other regular polyhedra cannot satisfy this condition. The sideways radius of the electron adsorptive substance is , and the lengthwise radius is . When the distance of two electrons is greater than , the electrons have the action of both electrostatic force and magnetic moment. When the distance of two electron is near , the magnetic force may be greater than the electrostatic force. When the distance of two electrons is less than , the adsorptive substances are changed, and the electrostatic force is greater than the magnetic force. This property of the electron magnetic force provides a basis for the model of the regular octahedron: if two electrons converge with the same velocity and direction, the magnetic force can be equal to or greater than the electrostatic force. Figure 5. Border upon distribution of north and south poles on regular octahedron. The first item explains that at close range, the nuclear force is twice the electrostatic force, the proton number is twice the electron number, 1/50 is caused by the interval of proton and electron. The second item explains that at long distance , the nuclear force according to decreases, the electrostatic force according to decreases; When the nucleon number A is from 50 to 64, the nuclear force and the electrostatic force at far range are equal, and the atomic nucleus is most stable. Figure 6. The double ring of same direction and parallel. 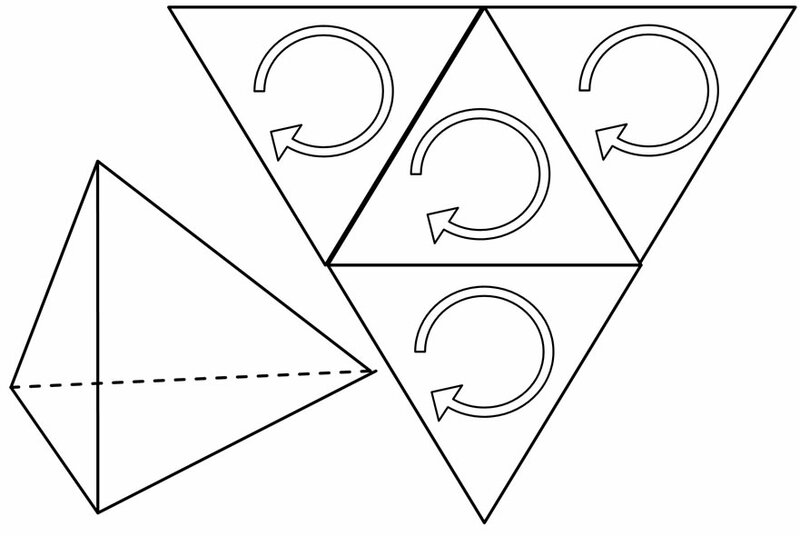 Outermost shell: regular octahedron, converge at the same direction. 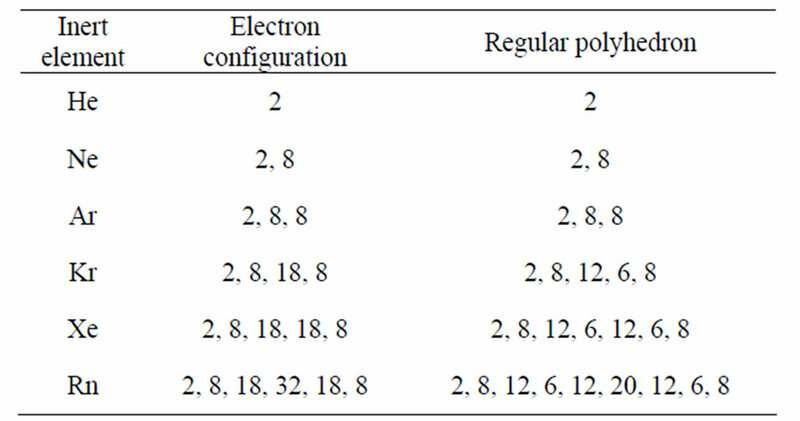 Thus the electron shell configuration of the inert gases element can be denoted by a row of the face number of regular polyhedron, inasmuch as it is in accordance with the electron configuration of periodic table of elements (Table 1). 18 is dodecahedron and hexahedron, 32 is dodecahedron and icosahedron. The orbital magnetic moment of the electron also engenders the adsorptive substance. The speed of the same shell electrons is near equation, the electrons can share the adsorptive substance, via its transfer. The energy of each electron tends to equate, and the adsorptive substance even increases the available distance of the magnetic force between electrons. The spin of atomic nucleus extends out and causes the first shell electrons to form a cylinder. For cylinder and regular octahedron, the electron motions of the parallel plane are in the same direction, forming a dipole, consistent with the spin polarity of the atomic nucleus. For hexahedron, dodecahedron and icosahedron, the electron motions of the parallel plane are in the reverse direction, forming a monopole, such as hexahedron with dodecahedron and hexahedron with icosahedron: these combinations can eliminate polarity. The inner shells of electrons are near the atomic nucleus, receive more adsorptive substances that are released by the nucleus, possess a higher negative charge density, and are at the accumulative position of the adsorptive substances. As such, the angular momentum of inner and outer shells is higher, shaping the regular polyhedron with more face numbers. The angular momentum of the middle shells is lower, shaping the regular polyhedron with lesser face numbers. Before atomic number 21, the regular polyhedron shell and the electron configuration is same in number. The regular polyhedron electronic shells of elements which atomic number are 1 - 103 see Appendix 2. Table 1. The regular polyhedra that are composed of inert gases electronic shell. The cluster of inert gas atoms can be described by models represented by regular polyhedrons or cylinders. 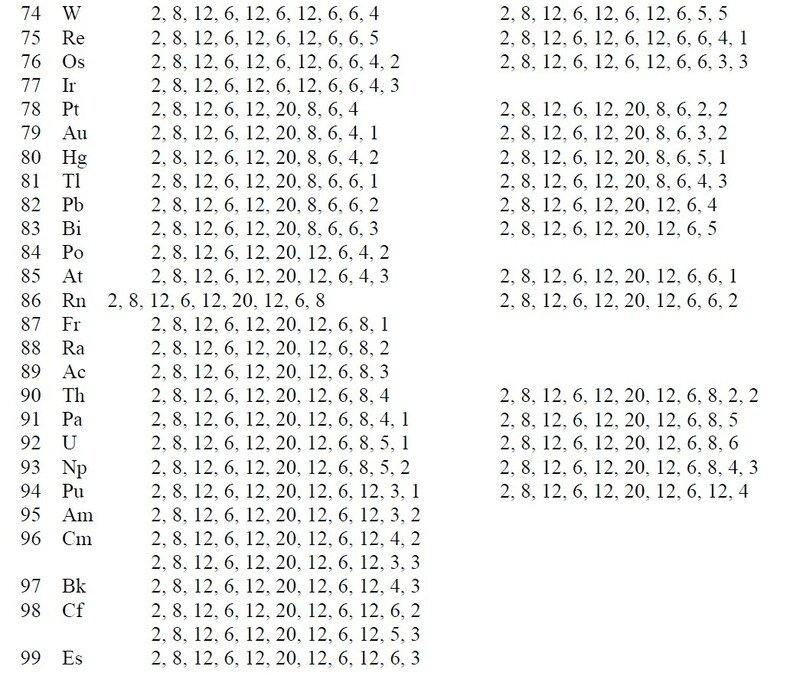 For the inert gas atoms Ar, Kr, Xe, clusters form according to the preferred magic numbers [3,4]. An explanation using a regular octahedron model can be described as follows: as atoms approach, two closer regular octahedrons have an edge superposed; consequently, two atoms share an edge. Each atom (one regular octahedron) has twelve edges, so each atom can join with another twelve atoms. If twelve atoms are directly set on the edges of a regular octahedron, the resulting structure shows defective tightness. The orbital adsorptive substances on the edge are actually shared by two atoms and these adsorptive substances can undergo excursion. To obtain a tight structure, in a regular octahedron, using a plane that passes through an edge and cutting a vertex with an appropriate angle (Figure 7), twelve edges cut twelve times will result in a regular dodecahedron. If the atoms are then set at its pentagon center, in this way, the resulting structure is the tight, and is in agreement with the descriptions in the literature . A Helium cluster  is different from other inert gas elements. The explanation using the cylinder model is described below: because the helium atom is a cylinder, it can arrange along the direction of a circle and the axis, to form different hexagonal structures, even two layer hexagons (Figure 8), the axes of two layers coincide with each other. Under the frame of quantum mechanics, the origin of metallic ferromagnetism is an issue that is yet to be resolved . Figure 7. Ar, Kr, Xe cluster. All of these have a regular dodecahedron; this is the origin of the magnetic properties of iron, cobalt and nickel. The respective free or valence electrons of the outermost shells are 1, 2, 1 or 2, 2, 2; while those of the hypo-outer shell are 3, 3, 5 or 2, 3, 4. The third outer shells are all regular dodecahedrons. Given that hypoouter shell cannot sufficiently form a whole frame. 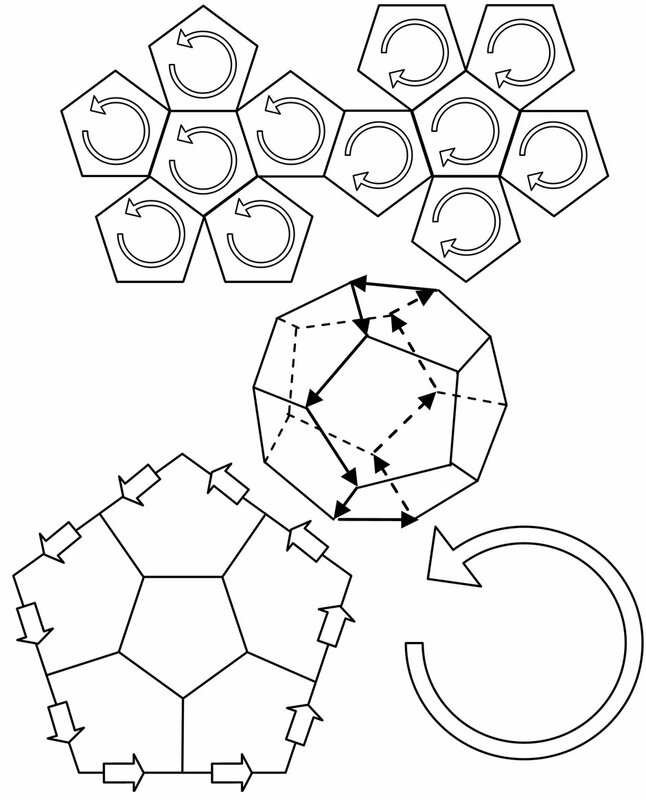 Thus, the hypo-outer shell and third outer shell form a frame of two shells together; the third outer shell of a regular dodecahedron is thereby fixed. Figure 9. 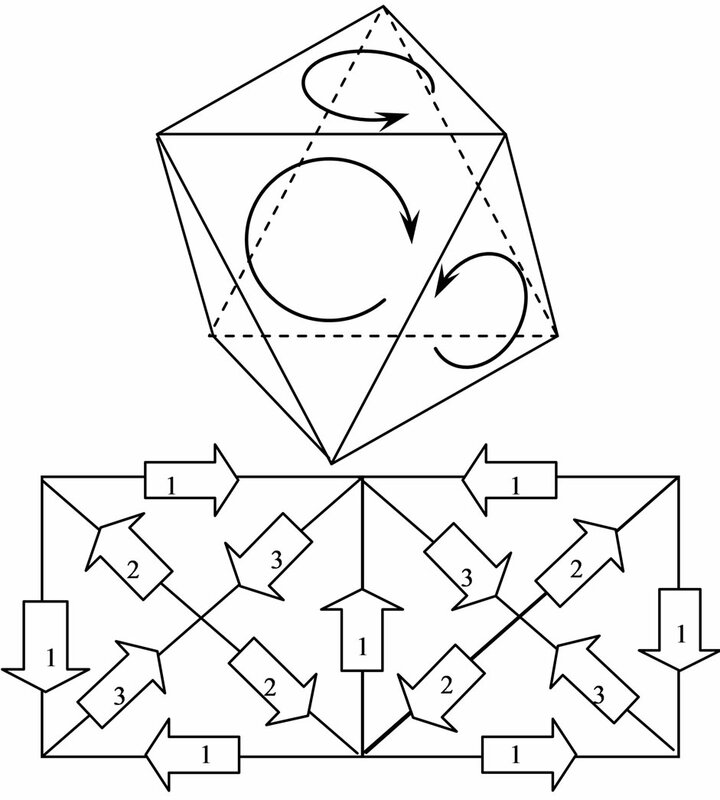 Electron motion and equivalent electrical current in a regular dodecahedron. Figure 10. Convergence of the two hemispheres; A, the opposite direction and B, the same direction. Figure 11. Convergence from the same direction for both A and B.
propinquity; thus, the magnetic moment of each electron are deemed as equal in a regular dodecahedron. Formulas (16) and (20) are concordant. Therefore the magnetic properties of iron, cobalt, and nickel can be explained by the regular dodecahedron electronic shell of an atom. The atom radius of iron is , from Formula (2) and , in the regular dodecahedron shell, the electronic velocity is . The adsorptive substances found in atomic nuclei and electrons are defined as magnetic particles called magnetons. As a term, “magneton” is commonly used to define or explain a unit of magnetic moment, as in the case of the Bohr and nuclear magnetons, among others. However, in this article, a magneton also denotes a type of particle primarily characterized by a property of magnetism. The magneton is a circle that circumrotates with the speed of light, wherein the radius can change; there are polarities that correspond to the frequency and phase. The magneton has two different kinds that are separately engendered by either atomic nuclei or electrons; these are called positive and negative magnetons. 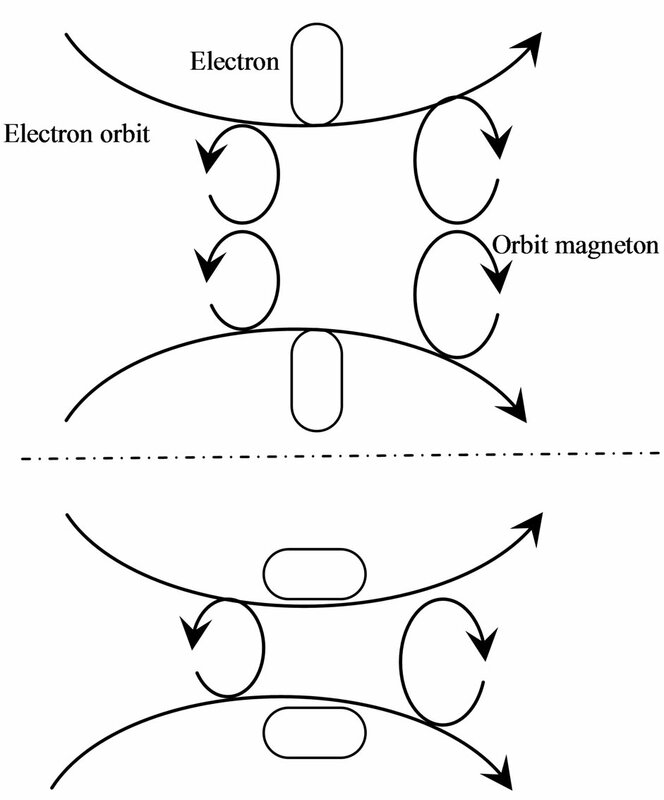 In an atom, the positive magnetons engendered by the atomic nucleus is released and then arranged into a circulative orbit of the electron, thereby forming an orbit positive magneton (Figure 12). The negative magnetons engendered by an electron have twenty petals and are attracted by electrons. When electrons move, they tend to release negative magnetons. These negative magnetons (1/20) form orbit negative magnetons, while others (19/20) turn into ray radiation. Some atoms do not have steady orbit negative magnetons. In this text, the orbit positive magneton is called an orbit magneton for short. The circulative orbit and velocity of electrons determine the orbit magneton quantity, which is capable of maintaining the redundant orbit magneton’s ability to transfer to another atom or transform into heat radiation even when orbit and velocity change. This means that the orbit magneton transforms into heat radiation when it does not have a containable orbit. After some orbit magnetons transform into heat radiation, an increase in electronic momentum will occur. Thus, the electronic orbit becomes capable of holding added magnetons, after which it can stop the process and then transform the magnetons into heat radiation. The frequency of radiation of the negative magnetons is generally higher than the positive magnetons (Table 2). The polarity frequencies of a positive magneton in all static atomic nuclei are equal. The magneton radius, periodicity, and the positive magnetons released from the proton are also equal. However, in the case of positive magnetons, which are released from the atomic nucleus (with more than one nucleon), the magneton radius and periodicity are not necessarily equal. Figure 12. Positive magnetons of proton and orbit positive magneton at electron orbit. 1) If two orbit magnetons have equal polarity periodicities and radii, the spin axes are in superposition and the spin direction are the same, then there would be no force action; if the spin axes are in superposition but the spin direction is in reverse, then there would be an at traction. On the other hand, if the circles of two magnetons border upon the same plane and the spin direction is the same, then there would be an attraction; in this case, the linear velocity at adjacent point is in reverse direction. 2) If two orbit magnetons have equal polarity periodicities but unequal radii, their spin axes are in superposition, and if the spin direction is the same, then there would be an attraction; but if the spin direction is in reverse, then there would be a repulsion. 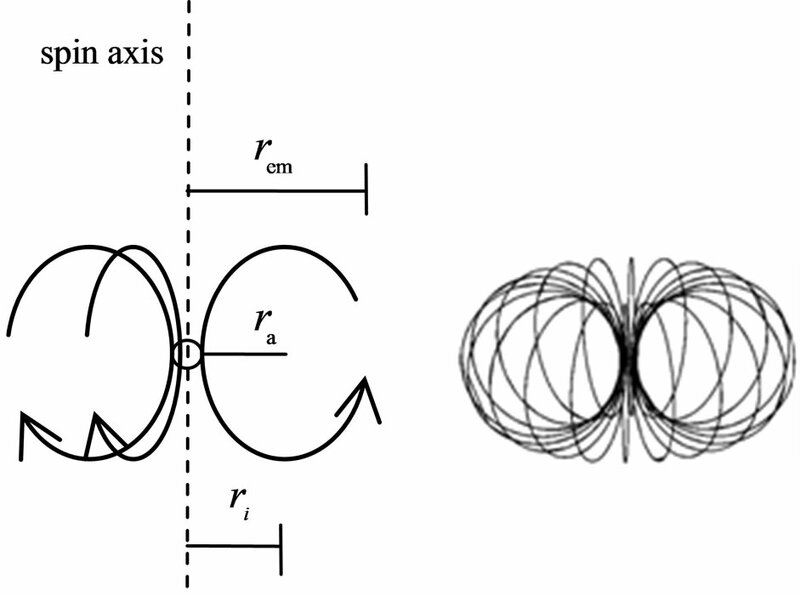 If the circles of two magnetons border upon the same plane and the spin direction is in reverse, then there would be an attraction; in this case, the linear velocity at adjacent point is the same direction. Figure 13. Attraction of orbit magnetons. odicities, there would be no force action. 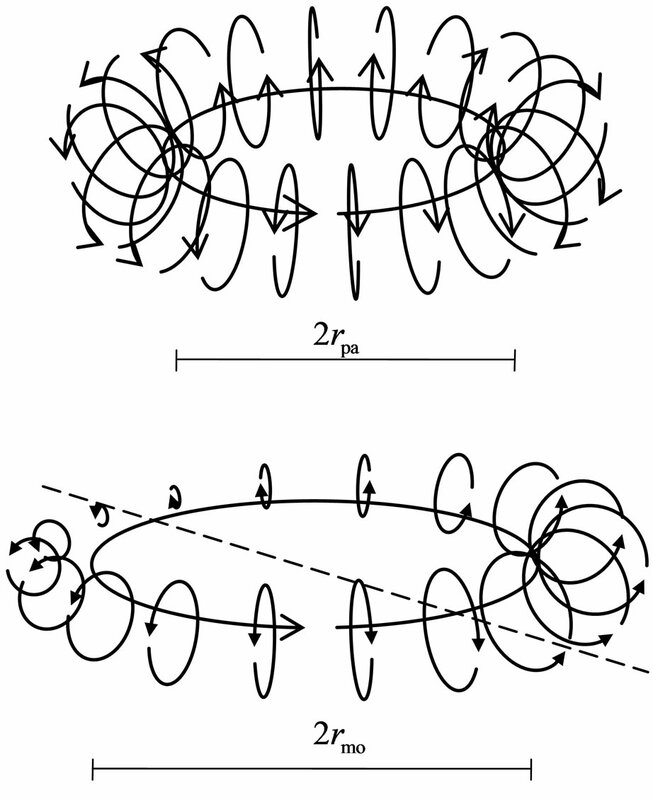 If a multi-orbit magneton forms a ring, the circle of each magneton would be perpendicular to the electron orbit (Figure 12). The orbit direction with similar spin directions and arrays would form into a single team or one with a reverse spin direction according to the radii (from large to small). If two magnetons form at the junction and the radii are equal, then the largest or smallest in the team will separate. If the orbit magneton ring on the electron orbit forms 2, 4, 6 and even more teams (two teams at the very least) and the magneton spin directions of the two adjacent teams are in reverse, this will lead to a magnetic moment of zero at the exterior. In Figure 12, the broken line separated two teams. For the electronic shell of regular polyhedron, the orbit magneton distribute in the edge of regular polyhedron. If the electronic motion does not periodically turn around, then the orbit magnetons would no longer form a ring so that the beginning would connect to the end. Beside the electron, two teams of orbit magneton would form an olive shape (Figure 14). When many atoms or molecules come in contact with each other, some parts of the action between electrons are processed via the orbit magnetons. If the orbit magnetons maintain stable attraction, then the object would be in a solid state. The attraction of the orbit magnetons can decrease the distance between electrons as the electron’s negative magneton show no apparent attraction. If the distance between electrons is shortened, this would cause a fraction of the orbit magnetons to be pushed out, leading to slippage between atoms or molecules; if this is the case, then the object is said to be in a liquid state. If most of the orbit magnetons are pushed out and the atoms or molecules are also bounced out, then the object is said to be in a gaseous state. 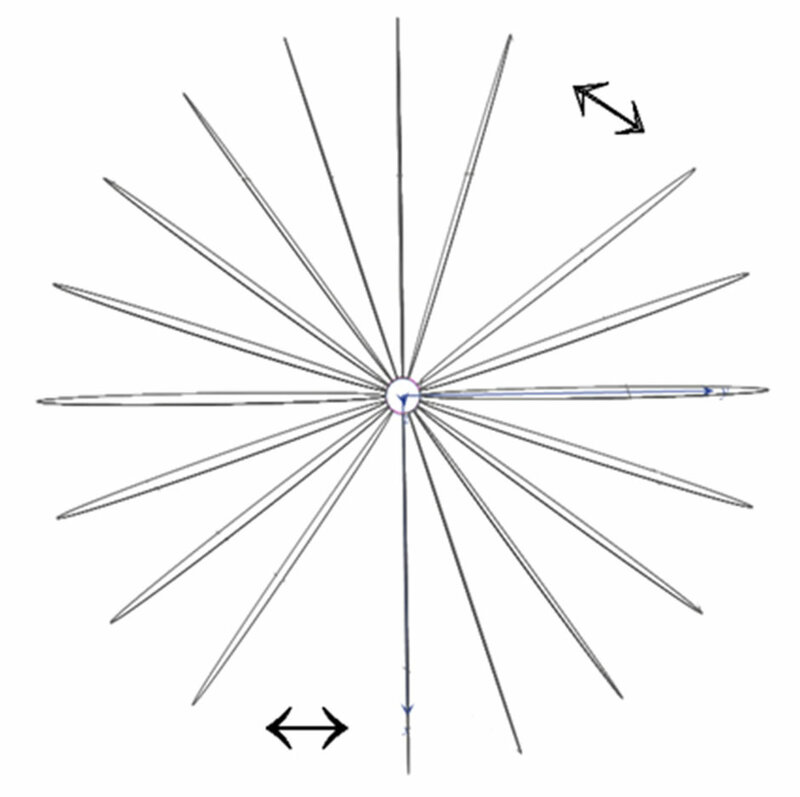 The attraction between the orbit magnetons is in direct ratio with the amount of magnetons. This is also related to the polarity periodicities and radii of such magnetons. Figure 14. The olive-shaped orbit magneton. magnetons and may become orbit magnetons. The overall velocity of the free positive magnetons is equal to zero. After the molecule captures the positive magnetons, the speed of the molecule would then be reduced. If molecules have same orbit magnetons, then their speeds are the same. The action of molecules in the positive magnetons is separated into the force of the free positive magnetons and the force of the captured orbit magnetons . On the basis of the inter-actional rules of orbit magnetons, only the same kind of molecules may attract each other and push out the orbit magneton; in this situation, the system tends to increase as many different kinds of molecules as possible and capture the maximum positive magnetons. The dimension of is work, the dimension of temperature is length, and the dimension of is force. From this relationship, we can say that the magneton theory can work well with thermodynamics. If , or , then it is said to be in a superconductive state. The directional motion of the electron can be maintained in the initial kinetic energy . is the non-collision superconductivity, and the superconductivity when collision speed is less than the initial velocity. Therefore, the part of electrical resistivity can disport three segments; these are shown in Formulas (42) to (44). For the expression see also . 1) Release the free electrons from the atoms of multiple sorts. 2) The atomic nucleus can release the positive magnetons with different periodicity, these positive magnetons can then form the orbit magnetons of multiple sorts. 3) Increase the speed range of the free electrons. 4) Restrict the motion range of the free electrons. 5) Decrease the density of the free electrons. In Method 2, the first requirement is an element with a high melting point and the second is an element with low rigidity. In [11-13], , where , , and are constants, then this is a case when there are two types of free positive magnetons. Fermi distribution is a case when there are two types of attractive particle, Bose distribution is a case when there are two types of repulsive particle. In the presence of orbit magnetons, similar particles can attract each other and molecules and electrons also behave in this manner. In such a case, the ion is also similar. When the glass of oxide (as SiO2) change from a liquid to solid state, though free positive magnetons decreasing, there are yet enough orbit magneton, the same ions will attract each other and can separately form an ion group of a similar type. The oxygen ions can then attract each other and form a group of oxygen ions; the silicon ions can attract each other and form a group of silicon ions. There are electrostatic attractions between the groups of oxygen and silicon ions. The structure of a glass is formed when a large amount and space of groups of oxygen ions connect and form a net where a group of silicon ions are embedded. 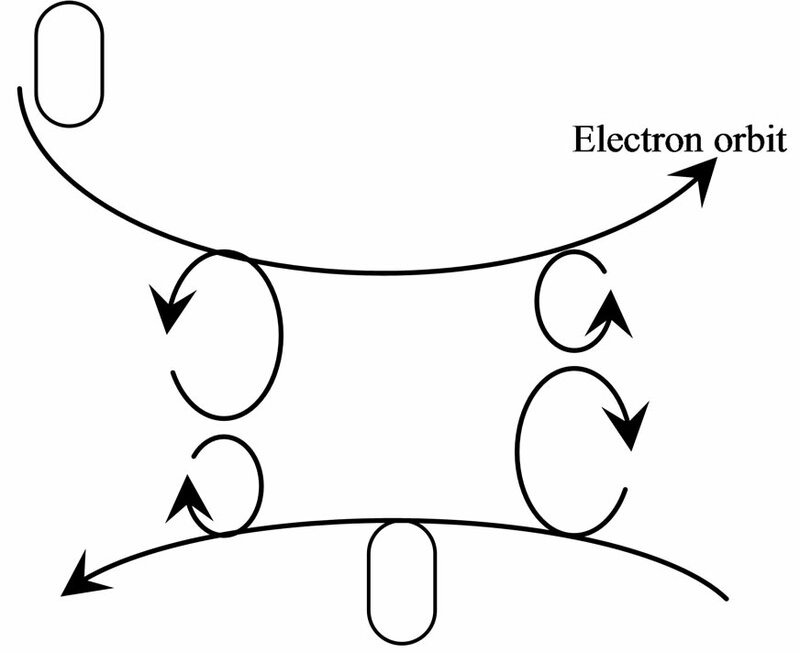 The chemical reaction is regarded as that occurs the electronic transfer, because only the electron those sort and velocity are same attract each other, the course of electron transfer from a sort of atom to another sort of atom, except electrostatic force require also satisfy two condition: first the electronic velocity is same, second is the mix of magneton: the magneton on electron come from several atomic positive magneton, form the orbit positive magneton on electron after mixed. The magneton mix also may be the change of magneton supply, the source of positive magneton from a sort of atom change to another atom. The magneton mix also may the electronic velocity go to equal. Usually the magneton mix easy in high temperature and pressure, and the electronic kinetic energy easy over the electrostatic force, the chemical reaction easy progress. In the situation of temperature and pressure are not change, the magneton mix becomes mostly factor that influence the chemical reaction. The magneton of electron formerly was circle. When two electrons approaching to a scope of distance, the magneton interact and being distorted, the circle plane occur bend; if the distance of two electrons are not changed anew, the bend of circle keep and are not change; at the farther position there is away the central electron, on the edge, the plane of magneton rotated a angle, the angle between circles become uneven. Formerly the magneton moving along circle with the velocity of light, this the tangent direction, the magneton is tangent with the central electron also, both spins keep be in mesh in certain phase; the circle of magneton swing in other direction when distortion, the advance speed is not speed of light in tangent direction, but is less than speed of light, the electron must moving backward and keep be in mesh. This backward motion of electron is the electromagnetic induction (Figure 15). The motion and spin axis direction of electron incline to superposition when the electromagnetic induction. Two electrons appear the electromagnetic induction; firstly the magnetons of electrons attract each other, the spin axis of electrons incline to same direction, and then the magneton swing, the electron moving backward. Two conditions which the free electron can electromagnetic induction is also two sort swings: the swing of the spin axis of electron and the swing of magneton. The swing of the spin axis cause the spin axis of electrons turning to same direction; the swing of magneton cause the electron that keep be in mesh with magneton moving backward. The electromagnetic induction is the change of the magnetic force causing the swing of magneton of electron, the electron moving, this induction differs from the magnetic force (Figure 16). Two relation of direction are reverse: the relation of the spin axis of electron with the act direction when electromagnetic induction; and the relation of the spin axis with motion direction when thermal motion. Figure 15. The swing of magneton. Figure 16. The swing of magnetons causes the electron moving. 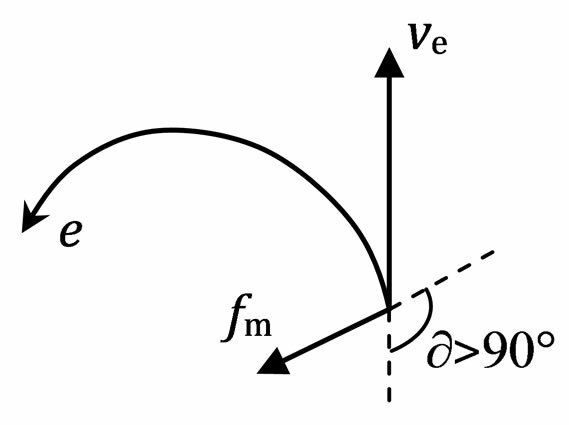 the motion direction of electron (or velocity ve) forms an obtuse angle ¶ > 90˚ (Figure 17). 1) The spin axis of electron turning. 2) A revolving ring with velocity of light exists in electron. 3) The swing of revolving ring. The momentums of instantaneous Lorentz force are not conservation, its action force and effect is perpendicular; the electromagnetism induction satisfies three conditions above are momentums conservation. The delay and inertia of the electromagnetic induction are greater than the energy of ionization, this explain also three conditions above. The electromagnetic induction can engender voltage, and engender current if there is a loop. When the area of an electric lead circle changed, each part that lead moving engenders voltage, the directions of these voltages are same; the perimeter of circle changed simultaneity, the perimeter has difference, the voltage to the perimeter difference are in direct ratio, the current is that the perimeter difference multiplies the amount of electron, the perimeter difference to the amount of electron are in direct ratio, the area difference to the square of the perimeter difference are in direct ratio, therefore the current to the area difference are in direct ratio. The electronic shell of the carbolic atom is 2, 4. Four electrons of the outermost shell formed a regular tetrahedron. 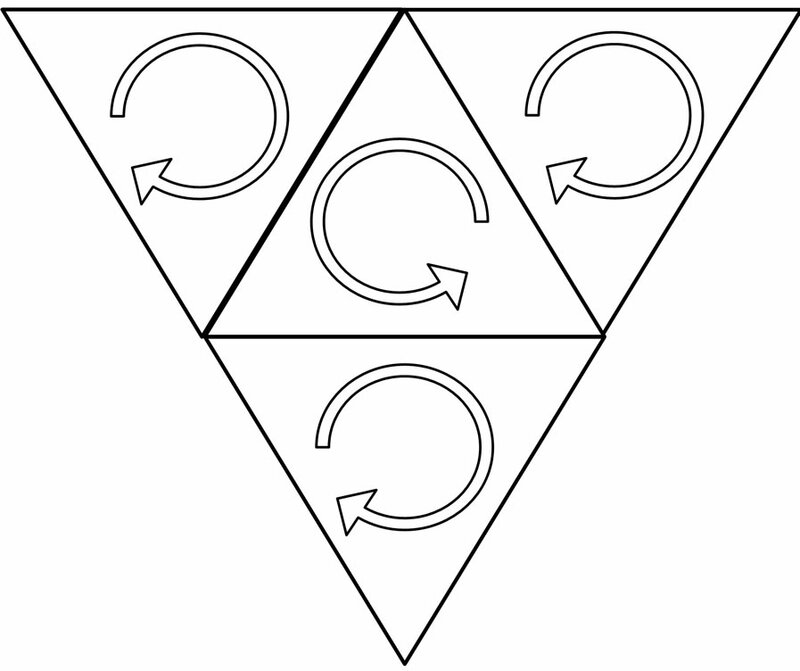 In the regular tetrahedron of atom of diamond, all four electrons converge from reverse direction; each atom is connected by superposition of vertex, that is share four vertexes, therefore each atom connect with other four atoms, and is symmetrical (Figure 18). Figure 17. A motion electron is affected by magnet. 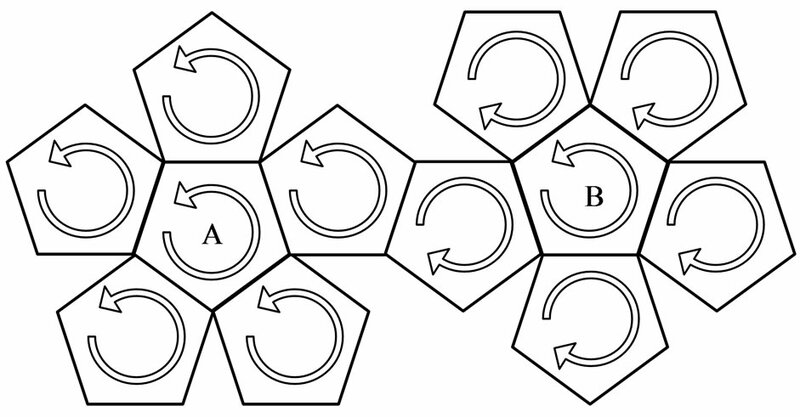 edges, which are converged from same direction, so each atom is connected with other three atoms, and is in a same plane (Figure 19), these atoms can connect into hexagon. 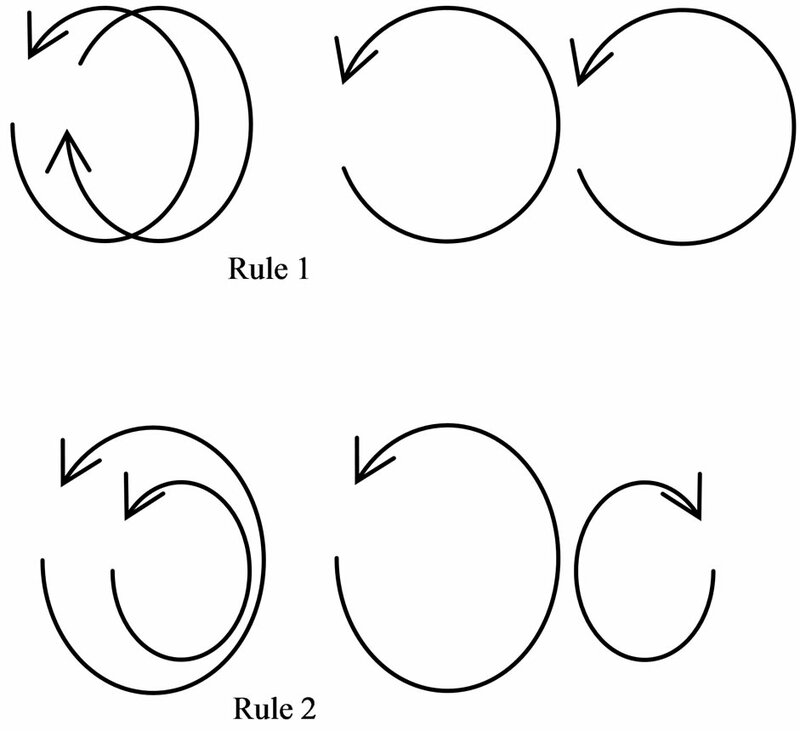 The converged electron orbit has two sorts of the same or reverse direction from the rule of magneton attract each other: when converge from same direction, the magneton of same radius attract each other; when converge from reverse direction, the magneton of different radius attract each other. The negative magnetons attract each other when converge from same direction, cause the electron orbit close up, and push out the orbit magneton (Figure 20); the negative magnetons do not have attract when converge from reverse direction, electron orbit the do not near mostly, and do not push out the orbit magneton (Figure 21). The electron of atom of diamond all are converge from reverse direction, electrons of adjacent atom are also converge from reverse direction, therefore do not push out the orbit magneton, have some attraction, and equipoise with electrostatic force of nucleus, the electron orbit is most stable. Figure 18. Diamond: four electrons converge from reverse direction. Figure 19. Graphite: three edges of same plane converge from same direction. Figure 20. Converge from same direction. Figure 21. Converge from reverse direction. The structure of the light is a helical line. The axis of the light helix is same from the direction of motion of light. The direction of motion of light is its direction of travel or propagation direction. is the helix angle of the light helix, . The helix angle approach 45˚ if the light density is high; when the light density debases, the helix angle increase, maximum approach 90˚, the helix almost become a straight line. The wavelength of light is the screw pitch of the helix. If the helix angle of the light helix is already 45˚ and the light density continue to increase, then the screw pitch of the helix change into short, that is the wavelength of light change into short (Figure 22). Two planes that are parallel with axis cut symmetrically helix, split helix into three parts, the middle part is a polarized light; if remove the middle part, two remnant parts are also a polarized light. The light in a magnetic field, the advance have a resistance; the subsequent part of the light helix has an act of pushing for the front part. In the act of resistance and pushing, the front part of the light helix comes into deflection; the deflection of the front part leads the subsequent part and comes into deflection. Therefore the light have a deflection in a magnetic field, the deflection of polarized light can easy be observed. When a light come close and into an object, have an act first with the magneton of object. Compton Effect is the result of act of the light and the negative magneton. When light get across the negative magneton, if the axis of the light helix and the spin axis of the negative magneton is superposition, then the helix has a repulsive force, the helix is expanded, the radii of the helix adds the radii of the negativemagneton, that is Compton wavelength of electron; the screw pitch of the helix adds the perimeter of the negative magneton , so the wavelength of light adds . The orbit positive magneton included two teams of positive magneton with reverse spin, when the light meets the orbit positive magneton, if the axis of the light helix is perpendicular to the circle of the positive magneton, then the light is reflected; if the axis of the light helix is parallel to the circle of the positive magneton, then the light gets across the positive magneton, come into being refraction. The positive magneton on the atomic nucleus à The orbit (positive) magnetons on the electron orbit à The radiation of heat. Figure 22. The helical line structure of the light. The positive magneton on the atomic nucleus à The negative magneton on the electron. The part of negative magneton on the electron à The radiation of light, the orbit negative magneton. The radiation of heat, the radiation of light + the orbit negative magneton with same frequency à The positive magneton on the atomic nucleus. When the magneton that mass is transform into the radiation of light of half periodic, the velocity of magneton become the velocity of light , the released kinetic energy is . The light can separate and form again. The diffraction is that the part of light helix is obstructed. The diameter of the light helix is less a little than aperture, the light passing through immediacy if it is at the center of the aperture; the part is obstructed if the light helix is not at the center of the aperture, and change in the directions. The diffraction of twain gap is that the separate light forms again if these phase is same. The light form again inside the object can explain the color combination. If the diameter of a light helix is less a several fold than another light, a light helix enter into the another light helix inside, the frequency of the combination light is add up, this is the combination of attraction; if the diameter of a light helix is less a little than another light, the frequency of the combination light is reduced, this is the combination of repulsion. The negative magnetons on the electron have twenty; the positive magnetons on the atomic nucleus have twenty also, these positive magnetons release out and become the orbit magnetons in the electron orbit, the positive and negative orbit magnetons change to positive magnetons on the nucleus via action; in this cycle, the atomic nucleus release twenty positive magnetons each period. Because the static attraction, the electron will fall on the nucleus if have not the supplement of the positive magnetons, the nucleus change to other nucleus by the action of the electron and nucleus. The number of the positive magnetons that the nucleus released has decided the maximal shell number of the electronic shells, twenty positive magnetons can support the maximal shell number is ten layer, the electronic shells if the shell number exceed ten layer, the electron fall easily on the nucleus, the nucleus is very unstable. If the atomic number is greater than 90, the electronic shells begin exceed ten layer, the most outer shell electrons already cannot form a whole frame, the electrons have no longer subdivide layer. If the atomic number is more, the electron fall easily on the nucleus and bring the nucleus change. Inert gas atoms form a cylinder and a regular polyhedron, forming the same shell electrons. The circle tracks of electrons motion are faces of polyhedron. The electronic number is the faces number of the regular polyhedron. 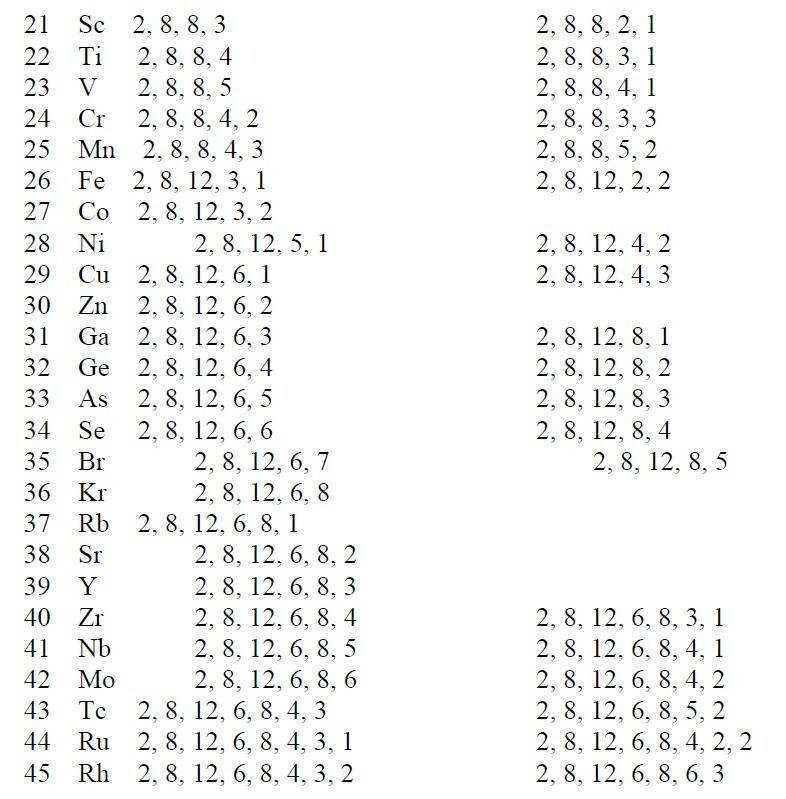 The periodic table of elements is arranged based on a series of regular polyhedrons. The electron has a magnetic outer layer and an electrostatic inner layer. The electron periphery has twenty-petal adsorptive substances, forming a big magnetism radius. If two electrons with the same velocity and direction converge, their adsorptive substances have the same rotational frequency and phase. The magnetic force is times the electrostatic force; the existence of adsorptive substance causes the magnetic force greater than the electrostatic force. The magnetic properties of iron, cobalt, and nickel can be explained through the regular dodecahedron electronic shell. The electron orbit converge from reverse direction can explain diamond. The behavior of the adsorptive substances is evolved into the magneton theory, and it can work well with thermodynamic. The free electrons do not have collision in high critical temperature superconductivity. In glass, the same ions will attract each other and can separately form an ion group of a similar type. The structure of the light is a helical line. The maximal shell numbers of the electronic shells are ten. X. T. Lu, H. J. Wang and B. J. Yang, “Atomic Nucleus Physics,” Atomic Energy Press, Beijing, 1981, pp. 46-47. G. S. Tian, “The Origin of Metallic Ferromagnetism,” In: 10000 Selected Problems in Sciences, Physics, Science Press, Beijing, 2009, pp. 73-80. H. Stöcker, “Taschenbuch der Physik,” Verlag Harri, Deutsch, 1996. Y. I. Frenkel, “Kinetic Theory of Liquids,” Oxford University Press, Oxford, 1946. M. B. Volf, “Mathematical Approach to Glass,” Elsevier, Amsterdam, 1988. Cylinder and all five kinds of regular polyhedra (platonic solids).